I would not reccomend this particular cruise. As my accomodation was not what was ordered or promised by Cruise119. I had booked for a window cabin and was allocated a cabiin with porthole and persudo window ledge. I am 6ft tall and I could not see outside the porthole, also I was heard the anchor downed and raised, causing noise every time we berthered at port, as the cabin was very close to the equipment being used. BOW END of ship. I found the vessel very confusing to find the different rooms, due to the layout of the ship. Never enough seating when all passengers were on board, and a deck chair mentality with the seating. Staff very helpful. Itinerary good and excursions efficient. The voyage was lucky to see the Northern Lights. The disembarkcation was very drawn out, and delayed. I expected better for a single paying double occupancy. some people on our cruise this was their first views after their 3rd and 4th cruise. Megellan Cruise G903, 10th January 2019. Just had our final documentation and have been notified that, due late arrivals of charter flights, and change of arrival airport, the ship won’t leave Cozumel until midnight, and that we will not be calling at Belize. No mention of any refund on port fees! When we have missed ports with other cruise lines, whatever the reason, we have been given a refund, yet CMV have not yet offered one. If the ship doesn’t visit the port, the cruise line don’t pay any port fees, so why shouldn’t we get a refund? I have emailed Gemma Bassy, Customer Services Manager, who sent out the documentation, asking why no refund has been offered. I suggest anyone who reads this, and is on the cruise, does similar. Hopefully, the voice of the people will encourage CMV to offer a refund. Back in May 2017, my wife and I decided to take a chance and booked to sail on CMV Magellan to see the3 Northern Lights. We choose this cruise because we liked the itinerary, the chance to see the Northern Lights and that it is a smaller (and older) ship. We have sailed on 8 other occasions from Australia using P & O and Princess Lines and from Southampton using P & O. 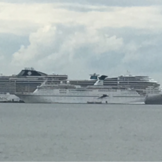 Apart from our first cruise which was an older ship holding around 1200 passengers the other ships had around 2,000 - 2,700 and they were crowded and busy on every public deck and eatery. We choose to purchase the premium package and found this financially very beneficial as we were given an upgrade from a guaranteed outside cabin to a superior twin outside cabin (6199) as well as including the tips and a couple of free bottle of wine. (We opened 1 bottle but preferred to drink in the bars so we left the other bottle unopened in our cabin at the end of the cruise. Embarkation We also choose the return bus ride from Victoria Coach station to get us to and from the ship. This was a good and cheap option as the bus took us straight to the ship for embarkation and as we had received an email that the ship would be sailing an hour earlier than originally planned (This was the first day after the change of time for daylight savings) and from a different wharf, we didn't have to worry knowing the ship would have to wait for us if we were late. Of course we were not late but as we were one of the last to arrive embarkation for us was quick and easy. We were through and on the ship within 15 minutes. Once on board we were given our cruise card and pointed to our deck and room which we had to find for ourselves. The ship uses a separate card for entry to your room which was disappointing that the cruise card couldn't be used to open your cabin door. So for the entire cruise we had to have our cruise card for drinks and a room card to get into our cabin. This was an inconvenience that we soon got used to. Cabin Our cabin no. 6199 was spacious we thought with a large window on the Starboard side. 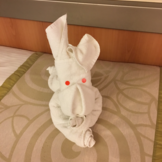 It had one of the best showers we have had on a ship with good strong flow and plenty of hot water that stayed inside the shower recess and did not go onto the bathroom floor and the mirror did not fog up!!! There was good closet space, although we did have to ask for an additional 20 coat hangers that were promptly provided. We hung all our clothes up and had 2 large empty suitcases that didn't fit under the beds so we placed them against the wall and that was fine. Even though we were at the back of the ship on deck 6, throughout the cruise we DID NOT have any strange smells in our cabin and the ONLY engine noise we had was when the ship engines started up or slowed down to pick up the pilot and this would last only for about 20 minutes but was not too obtrusive. It didn't bother us. Ship Naturally we explored the ship and like every other ship we have been on the layouts are very similar with bars, showroom, general entertainment areas, public areas, dining areas, photography, shopping and pool and deck areas. The main restaurants, a small cocktail lounge, table tennis and shopping areas (Small and limited in stock compared to other ships but we found some items that we bought) were on deck 8. On Deck 9 were the bars (plenty and all good) and other drinking areas, small casino and a coffee lounge. Deck 10 had the bistro and main deck area which was rarely used during our cruise due to the time of year and some weather conditions on some sailing days. The ship was easy enough to get around and while some may say the colour scheme may be outdated it was all good and functional and did not detract from our experience of an older ship. Some people would be excited and call it "retro" it depends on your perspective. Entertainment. After reading ship reviews and watching some you tube videos on the showroom entertainment we were worried as it didn't look exciting. How wrong we were!! The 4 main singers CAN sing and sing very well. The only observance I would say is that not all of the songs they sang I thought best displayed their voices and the ad-libbing by the males between songs needed to be improved. There is also a 6 piece live band that accompanies the singers who were FANTASTIC! I will make special mention of the violinist who played many solos and accompanied a pianist in one of the cocktail bars as he was OUTSTANDING!! One of the singers had her own night singing opera. She was fantastic and received a standing ovation. This was the last night of the cruise and she is spectacular singer. The dancers were also great and in particular a couple of the male dancers did some outstanding Russian dancing moves. The costumes were very colourful and exciting. Sometimes the choreography was a bit basic but overall there were some of the best shows we have seen on a cruise ship. On four nights we had 2 comedians, one was funny enough for me while the other one was probably past his best, but did say 2 funny lines when he did an adlib. Overall we looked forward each night to the shows. Activities & Guest Speakers The only activities that interested us were the Guest Speakers, The Star man talking about the stars and the Northern Lights was very fascinating and passionate about his studies, The Whale man was a bit dry for me and the craft person, we weren’t interested in. The shipboard activities weren’t to our liking much except some of the quizzes, although I didn’t think it was good when you self-marked your own quiz. The late night entertainment was reasonable at times but again the ad lobbing by some of the singers when hosting wasn’t good at all. The disco for us was also a bit disappointing as the music wasn’t always to our liking. But for other passengers, the game shows were well attended to and they obviously liked them. The cruise entertainment director David was fantastic and full of energy and new when to take the Mickey out of passenger contestants. His personality and style helped make the cruise! Around the bars, the music and singers were good and relaxing. Passengers were dancing and enjoying listening as we did to the pianist and violinist in the Hampton’s Lounge before and after dinner. The captain was seen regularly walking around and talking to passengers. We had a chat to him when someone we were sitting with thought he was a drinks waiter and asked him for a drink. The Captain was the most approachable and friendly Captain we have had on any of our cruises. He had a personality, told some jokes and we congratulated him on his steering of the ship through the hurricane winds. He then explained what he did and why he did it and the ships ability to cope in simple terms. The Captain also told us that during his previous 16 trips to Alta in Norway he had never seen the Northern Lights until this cruise. He also said that many of his visits to Norway were during the warmer months. Dining We dined each evening in late session in the Kensington Restaurant placed on a table of 8. We had marvellous table guests and we all got on very well. This helps to make a cruise if you dine with people you get on with. We had a lot of laughs and good conversation. Each evening the 6 course meals were delicious and filling. The variety and quality for our meals were outstanding. For me it was hard to choose which main meal I wanted so I would ask our waiter each night for his recommendation and to surprise me. He did very well and I enjoyed all of my meals. Our drinks waiter was also very good having my glass of red waiting for me each evening. The waiters were very popular on our table. We had breakfast and most lunches at the Bistro. We found if it was very busy just wait 20 minutes and there would be plenty of tables. The food quality and variety was reasonable here without being outstanding. Sometimes they were short of coffee mugs or replacing meals but serving so many people this can happen and you just wait a few moments. I will say that I didn’t like the breakfast sausages. To me they didn’t taste too good but, most of the passengers were eating them. 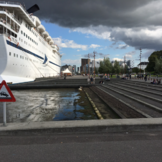 The Cruise, Ports and Excursions. To us the Magellan has character and charm and is not busy with too many passengers. It is easy to get around and even though we travelled through a Gale Force 11, 120kmph Hurricane winds with 7-9 metre waves for 20 hours on our first full sailing day, WE LOVED OUR CRUISE. We later spoke to the Captain on his remarkable handling of the ship during the hurricane winds. He told us that he knew the capabilities of the ship and that it could take plenty more before it became a concern. He said he had the ship listing at 60 degrees to tackle the winds as the ship could go to an 85 degree list safely. He also said that land during this time was still over 150 miles away so he would have to have gone further into the winds to go to a port and the n the remaining itinerary would have to have been changed to allow us to return to England on time. We have no problems on the decisions he made that day. The Ports we visited were wonderful with Bergan being our favourite. Alta came second because even though it snowed in the morning and we had heavy cloud all day and the tour guide said we only had a 47% chance of seeing the Northern Lights, we still saw them. The tour guide took us out at 8.00p.m to a secluded place about 55km inland and there we had a clear sky and for 2 hours we witnessed the magic and dancing lights. This was a highlight of the cruise. When we returned to the ship the Lights were still showing over the ship but not as bright as we saw them on the excursion with no town lights to distract. We also saw wild reindeer on the road as we travelled on the excursion. The coldest place we visited was the North Cape. At minus 3 and with horizontal bitting wind this was invigorating. All of the ports we visited had good and very good points of interest for us and we were glad we visited them. We saw many sights that we had never seen again and the snow-capped mountains, Fjords and wildlife was spectacular. When we booked our excursions we thought they were a bit pricey but checking local Norway websites for private tours we found the ship tours were very reasonable and value for money. Norway is an expensive place to visit with a small paper cup of instant coffee and a small coke costing 84 Krone (about 17 Australian dollars or about 8 GBP) Disembarkation For us travelling on the cruise line bus to Victoria Coach Station disembarkation was quick and easy. The ship docked at Tilbury around 8.15a.m. and we left the ship on schedule at 10.05a.m picked up our bags and got onto the bus and even though it was Remembrance Day (11/11) we had an easy drive into London, travelling over Tower Bridge, and were at Victoria by 11.30 a.m. We did see other groups waiting to disembark were running over an hour late but did not know why. Summary In summery we had a great time, we didn’t suffer any sea sickness and would easily travel on Magellan again. While I have read some other reviews of this same cruise I understand that everyone has their own expectations and experiences and any review is subjective. However, you do need to remember that this IS NOT a 5 star party ship, it is an older ship and that must be taken into consideration. You can either look at events as disappointing or you can look at them as an adventure. Looking back and at the time we thought the hurricane was an adventure to experience and say we did it. (I hope that we don’t have to do it again) My point is once you see things in a negative light it makes it difficult to enjoy the positives. The cruise, ports and excursions exceeded our expectations and as such we had a great time. Very clean and lovely staff. We would definitely cruise with them again! Just brilliant and meet many good friends. Crew and staff are friendly ,ship is always clean and tidy, food is lush and keeps coming. Thoroughly enjoyed the cruise but felt the time spent at sea was a tad long. Some of the shore visits could have been longer. This is the worst ship I have every been on . The staff were rude especially the reception staff the food was ok the organisation was awful the room was not ready at 10 pm the port of call cut short . A very pleasant and different way to spend the weekend. I have had the most fantastic time, seen beautiful places, made new friends, had some very relaxing days where I could do what I wanted, saw some Dolphins, gannets and puffins. It has been brilliant, I wished I could've stayed on longer. I would recommend it to anyone. I have sailed on this ship 3 times already and would recommend it to anyone. I am going back on her next July and very much looking forward to it. The cabins are always kept clean and comfortable. The ship is constantly being kept spotlessly clean. I have heard some people complain about toilets being shut while being cleaned but there's plenty of other toilets. The staff are friendly, helpful and professional and are always smiling. The food is delicious and there was plenty of it and a great variety. There are lots of games and activities laid in but it is all very relaxed and friendly with nothing pushed on you. You can take part in as much or as little as you like. Cabin 4032 12/5 to 19/5 Have just returned from the Norwegian Fjords cruise. What a great experience the Magellan is an older ship that could do with a bit of TLC. That said the crew and facilities were first class. The fine dining in both the Waldorf and Kensington restaurants was first class. The buffet was always more than adequate with a lovely pizza and pasta bar. Breakfast in the morning was always busy in the buffet. I would recommend that you go to one of the two aforementioned restaurants for breakfast. Drinks package is also highly recommend as we had more than our share of premium alcoholic,soft and coffee beverages. Overall a great trip and the scenery in Norway was breathtaking. Super cruise from a lovely cruise line full of hard working staff. Lovely excursions and a wide variety of things to do. Food excellent. Das Schiff: Die Magellan hat uns sehr gut gefallen, vor allem die vielen Außendecks. Man kann viel draußen rumlaufen, findet auch mal eine kleine ruhige Ecke, um die Aussicht zu genießen. Man kann noch über der Brücke nach vorne gehen und hat hinten noch schöne Terrassen. Die Restaurants waren auf einem Deck und nicht all zu groß, dadurch war es nicht all zu laut und man konnte sich gut unterhalten. Die meisten Bars waren auf Deck 9 was wir als angenehm empfanden und so schnell mal die Bar wechseln konnte, wenn man andere Musik wollte. In allen Bars ausser dem Pub wurde Live Musik gespielt, von Band über Piano bis Klassik. Das Einzige was uns fehlte, war ein Innenpool oder wenigstens Whirlpool. Diese waren alle draußen, aber auf unserer Fahrt war es zu kalt und windig um sie zu benutzen. Sauna und Dampfbad im Spa war kostenlos, haben wir aber nicht genutzt. Das Schiff war sauber und es wurde immer instand gehalten. Klar, es war mal der ein oder andere Fleck auf dem Teppich oder Polster, aber das bleibt ja nicht aus, wird ja immer mal was verschüttet oder gekleckert. Wurde aber immer sofort gereinigt so gut es halt geht. Wir fanden, das Schiff sah für sein Alter richtig toll aus. Essen und Getränke: Wir haben Morgens, Mittags und Abends immer im Bedienrestaurant gegessen, war eine angenehme Atmosphäre und das Essen war immer lecker und abwechslungsreich. Nach dem Essen gab es immer noch Kaffee oder Tee an den Tisch. Morgens hatte man die Möglichkeit am normalen Buffet, in einem der zwei Restaurants an einem kleineren Buffet oder in dem anderen Restaurant sich komplett bedienen zu lassen. Es gab eine kleine Karte mit Gerichten und es ging immer jemand mit Brötchen, Toast, Teilchen, Kaffee und Saft rund. Mittags gab es täglich a la Card oder Buffet genau wie Abends. Und die frische Pizza gab es immer von 11.00 bis 17.00 Uhr. Buffet haben wir nicht genutzt (ausser Pizza) sah aber immer gut aus. Die Getränke waren alle lecker, Softdrinks gab es noch in Dosen und alles was man an Markengetränken so kennt. Wir hatten das VIP Getränkepaket, was sich für uns auch mehr als lohnte (man bekommt für jedes Getränk einen Bon und ich habe zuhause mal alles zusammen gerechnet). Genaue Infos zu den Paketen sind auf der Internetseite von CMV, dort ist auch eine Barkarte mit Preisen. Personal: Der Service war einfach superfreundlich, immer ein "Hallo" oder "Wie geht´s? ", auch wenn man nur vorbei ging. Im Restaurant gab es noch zwei Kellner, Wein und Wasser war noch nicht leer, da wurde schon nachgefüllt. Auch die Zeit zwischen den Gängen war angenehm. Aber auch das restliche Personal hatte immer ein freundliches Hallo für uns. Unsere Kabinenfee war einfach toll. Das Führungspersonal war sehr präsent und fragte immer, ob alles ok ist und es uns gefällt oder war einfach mal für ein Schwätzchen da. Wir hatten ein paar schöne Gespräche mit unserem deutschen Staffkapitän und dem deutsch/italienischen Hoteldirektor. Auch die deutsche Reiseleitung (Spanierin) hat sich immer um uns gekümmert und war besorgt ob alles Ok ist und wir zufrieden sind (waren nur 6 Deutsche an Bord). Ich muss sagen, es fühlte sich alles irgendwie familiär an. Wir fühlten uns wirklich willkommen und als Gast. So, ich denke das wars. Wir werden jedenfalls in den nächsten Jahren nochmal mit CMV/Transocean fahren, haben noch ein paar sehr Interessante Schiffe und Routen. Day 4 of cruise. Friendly and helpful staff. Good food in main dining rooms but bistro is not such a pleasant experience,- not enough seats and the atmosphere of a work*s canteen, Only one 24 hour coffee station but cruise information stated there were several.. Entertainment staff very enthusiastic and keen to involve guests without being too pushy, various degrees of talent evident in the nightly shows. Cabin spacious but air con a bit hit and miss. Overall enjoyable and I hope the next few days continue to be so. This was my 15th cruise, and I can honestly say its been the only one where I was glad to get of the ship! Very poor facilities, abysmal service, very very poor entertainment and absolutely shocking food! If this was your first cruise please don't let this put you off doing another. I'm only giving it one star because it won't let me click next without it. If you choose to follow Magellan you will receive weekly email updates with the latest reviews, tips, and photos from Cruiseline.com members about Magellan.